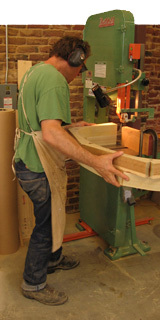 Ray Buffalo Fine Woodworking LLC is a one man specialized woodworking shop in downtown San Francisco. The shop focuses primarily on curved wood moldings: for example, arched casings, arched jambs, curved crowns, baseboard, bar rails and handrails. All of these are fabricated from a variety of solid woods. The molding profiles are largely custom to match customer's sample and application. High Speed Steel is ground to match sample or drawing, then used to shape the wood curves. The shop has a large inventory of in-house tooling as well. Small batches of custom architectural components such as decorative brackets, curved cabinet doors or curved mantel parts are also part of the everyday workload. © Ray Buffalo Fine Furniture LLC, 2004-2008. All Rights Reserved.